Subscription boxes have gained momentum over the years, much to the delight of just about everyone. Who doesn't enjoy a box of their favorite themed items delivered to their door? With the explosion of the industry comes a variety of options out there for just about any topic you can think of, from animals to geekdom, from self-care to, yes, even witchcraft! But how do you select the right one? How do you even begin to find them all? Enter Cratejoy, a marketplace that collects tons of your favorite subscription boxes (and more that you may not even know about) and puts them all on one site! Cratejoy conveniently sorts boxes into select categories, such as "Beauty and Fashion" or "Geek and Gaming," and even offers the ability to search for whatever topic you choose. All I did was hop to the search bar and type in "witch." It didn't take me long to discover a plethora of new subscription box services I didn't even know existed! Even more so, Cratejoy has been instrumental in assisting small pagan and witchcraft business owners in finding their voice. If you're a small business wanting to get your feet off the ground and running, I have three words for you: Subscription box marketplace. As a small business owner, you can easily and securely start your very own subscription boxes. Cratejoy makes reaching thousands of potential customers a cinch! When Karen at Cratejoy asked if I would be interested in reviewing subscription boxes offered through their website, I was enthusiastic. I can't wait to show you guys what Cratejoy has in store for you! In today's spotlight? The newly created Mystic Muse. 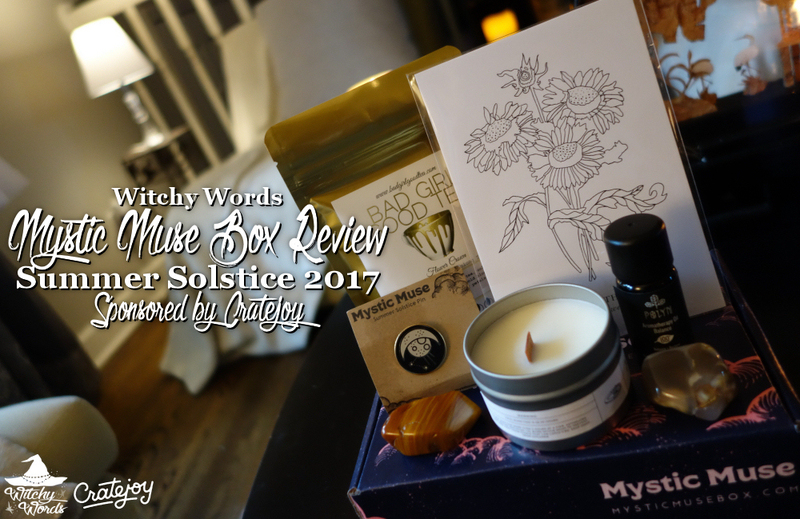 Mystic Muse totes itself as a new age self-care goodie box, offering items that will help you relax whether you're dealing with Merc Ret, a full moon or a solstice ritual. The owners of the subscription box state that the products contained will assist you in your overall mental and physical well-being, helping you wipe away the spiritual and stressful grime of life. Their first box release is themed for the summer solstice and contains relevant items to help you during this specific time of year. Upon opening the box, you're greeted with a well-designed card that outlines all of the products contained in the box. I'm appreciative that supplying companies are noted and each item is described for its usefulness during the solstice. Also, I have to give huge points for design. The box is compact but not uncomfortably so, and the pamphlet and box have a sleek, modern and eye-catching design with pleasant colors! This month's box begins with a beautiful sunflower print by Camille Dollins. Included with this sturdy and clear print is a informational card on sunflower symbolism. The pamphlet suggests coloring it yourself or framing it (potentially for your altar). You can find more work by Camille Dollins here. The next item in Mystic Muse is Flower Crown, a tea by Bad Girl Good Tea. A white, green and oolong blend, this tea promises to be light and subtly fruity. What I particularly liked about this tea's packaging is that it states directly on the label how to make this tea. This is perfect for those who don't regularly make loose leaf or who may not know how to make this particular blend. I absolutely loved this gorgeous, high quality solstice pin included in the box. This isn't your typical plastic, printed pin as you can tell by the reflection of the sun in the gold accents. You best bet I'll be wearing this to my solstice celebrations! It's a wood wick! Wood wick candles make a delightful crackling sound, add a bit of a wood scent and slow down the burn of the candle. The next item in the Mystic Muse box is this Aromatherapy Oil for balance by Polyn (by SKINourishment). Neither the packaging or the pamphlet make any attempt to disguise this as an essential oil blend; it is definitely an aromatherapy blend. You can tell because one of the first ingredients is coconut oil, a filler that's great for the skin but certainly not included in essential oil blends. A note that this blend also states that it includes rose hip oil, but it's in fact rose hip seed oil. Now I'm not sure if that that means that they're using the entire fruit including the seed or just the seed. Either way, the seed is the better of the options but it does tend to make a difference to the magical practitioner. Finally, one of the first things I noticed when opening the bottle is a distinct alcohol scent. On the list of ingredients is vanilla bean extract, an alcohol-based tincture. The pamphlet mentions that you could use this around your eyes but, because the alcohol scent is so strong, I would personally avoid that as it may cause some irritation. As always, check the ingredients list for any allergies before utilizing any oil or oil blend. One of my circlemates, Amy, is a certified massage therapist. Her suggestion? "If you want something that smells nice, use it for that. If you want to add it to lotions or sugar scrubs so that it smells pretty, totally great. If you want it for any kind of therapeutic or magical purposes, I wouldn't suggest it." I always love getting stones in boxes. It's how I keep my collection afloat! This box includes yellow jasper (left) and ice agate (right). Yellow jasper is noted in the pamphlet as "carrying the energy of the sun" and ice agate is quoted as being a "good grounding stone." The yellow jasper certainly hearkens to the season while the ice agate keeps in tune with the self-care theme of the box. With that, let's talk about some of the pros and cons of Mystic Muse over other subscription boxes. The informational pamphlet has most of the information I would crave about this box, including suppliers and how to utilize the items (whether or not I disagree with it). It includes hashtags to suppliers so that the customers from this box can connect. I absolutely love that. Likewise, the box and pamphlet and the box itself are incredibly well designed and of quality material. I love the consistent theme between the box's design and the pamphlet itself. As a professional artist, I can't speak strongly enough about how much design matters to a product like this. They're definitely on point! Not too much and not too little, just big enough to keep everything safe and just small enough to be easy to carry and collect! I certainly love the theme of the box. The concept of a box that encourages you to relax with your craft rather than utilize your energy is pretty spectacular. That being said, I wish it included more self-care items. While I absolutely love the pin and will use it, I don't know if it's particularly in line with the concept of self-care. I would have loved to see some bath salts, bath bomb, sample lotions or natural chapsticks. I also almost always get some kind of essential oil/aromatherapy blend in each box I get. These generally end up on a shelf, get used once or twice and then get forgotten about. Maybe that's just me. That being said, I think the overarching theme has great potential. The price of this box is a little steep - $45. I've reviewed boxes in this price range before but I find that they typically carry either more items or higher quality ones. This is definitely on the more expensive end for how small this box is. A small addition or two could really make this box pop for its price. If you're interested in checking Mystic Muse out, click here! And, of course, Cratejoy overall is a pretty fantastic marketplace for all your subscription service needs, be it buying or selling. I agree with you on the essential oil. I think it's the biggest downside of most pagan boxes on the market. Like you, I use them once of twice then put them away. They end up taking up valuable space. I'd honestly rather have more crystals. I love the selection of items... HOWEVER. I can't get over that price. I don't feel like the amount and/or quality of items are worth that steep price. $45 is a lot for me and if I were to treat myself I'd want the most for my money such as Sabbat box which I've been happy with in the past. I agree with you Lauren. Many subscriptions at $45, like Sabbat Box or The Moon Box, have much to offer in comparison. Fortunately, Mystic Muse's creators have been listening and have revamped the contents of the box. I'm looking forward to giving it a second try!